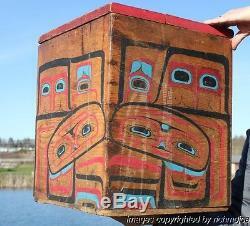 The bentwood box was one of the Northwest Coast Indians greatest innovations. They took a long large slat of hand hewn cedar made grooves, softened the wood with steam and bent it in rectangular form. The ends were then pegged, sewn or nailed together. The cedar was naturally bug resistant and made this vessel an excellent place to store food items. This box is crafted in this way, the ends and bottom are mostly nailed together though there appears to be some wood pegs as well. These boxes were used in the Native households to store food items, regalia and supplies. The box measures an impressive 16" x 15 1/2" and stands 19 1/2 tall and is painted with a rare corner oriented design done in an archaic old school pattern, complete with its old original lid. Painted in red, blue, and black pigments. The box is in very good condition for its age and showing staining, a native old repair to the lid, paint wear as expected with great age and use. Please view all the photos An old museum number "211 011" is visible on the inside of the lid. The box itself is most likely older than the painted designs which I believe was done in the early 1900's. A great display item and a fine addition to anyone's collection. Please check out other current offerings including a great Tlingit, Haida, Tsimshian and Kwakiutl totem poles, many historic baskets d e- accessioned from museum collections including Salish, Haida , Tsimshian , Cowlitz and Tlingit examples. Also some great early Inuit carvings. More than just a pretty picture. FREE scheduling, supersized images and templates. Over 100,000,000 served. Get FREE counters from Vendio today! The item "FINE RARE OLD NORTHWEST COAST TLINGIT BENTWOOD PAINTED STORAGE BOX c1880" is in sale since Monday, March 07, 2016. This item is in the category "Collectibles\Cultures & Ethnicities\Canada\ Aboriginal".